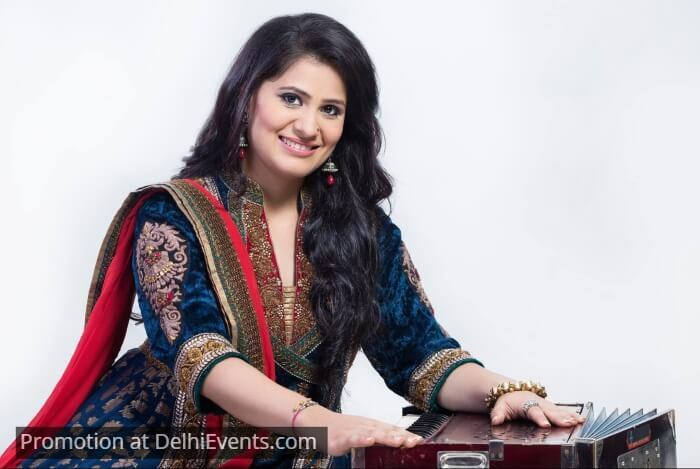 Event Description : MUSIC : CKRDT Foundation Presents "Seasons With Krishna" Vocal Recital by Vidhi Sharma. · "Seasons with Krishna - A vocal recital by Vidhi Sharma" is never-been-done-before concept in vocal music. Krishna- one of the most loved and the most popular dieties- played various roles in his avatar- as a cowherd, as a Lord himself, as the beloved of Radha and the gopis, as a preacher etc. · The krishna leelas, the folk tales have been written in the form of various scriptures Puranas, hymns by the known and unknown saints etc. The vast literature on Krishna is sung in various styles of music across the length and the breadth of our country. · Seasons with Krishna captures the essence of Krishna's life attuned to all the six seasons - Grishma ritu, Varsha ritu, Sharad ritu, hemant ritu, sheeth ritu and Vasant ritu; focusing more on the rain season. The range of emotions viz-a-viz these six seasons display various forms of bhakti and the nav rasas of viraha, shringar, karuna, shant, adbhut etc. · The large and rich repertoire will include traditional poetry by Meera, Surdas, Krishnadas, Nanddas, Parmananddas etc. These pioneering poetic works will depict folk tales of Krishna and his emotional world attuned to the six seasons. · The emotions of a devotee towards the Lord will also be addressed that will express the various forms of Bhakti like dasya bhakti, sakhya bhakti etc. Apart from these, the performance will also include thumri and traditional folk singing that present krishna leelas from a different perspective. The seasonal thumris like jhoola, kajri, hori etc specifically are performed in rainy season and spring season respectively and talk about how Krishna, the beloved and all his folks and friends are playing on the swings in the monsoon or playing hori n the most mischievous ways! · The different styles of music apart from wide range of poetry including folk poetry will capture the spirit of seasons and how they influenced emotions of Krishna, his friends and his devotees. The vocal rendition will be done in the soulful and versatile voice of Vidhi Sharma. · Seasons with Krishna will be a celebration of Krishna's life- it will include some interesting rare anecdotes and folktales, the various famous leelas, and the emotions of love, longing, devotion, festivals etc pertaining to all the six seasons. · Vidhi Sharma has been awarded the title of Bhakti Ki Awaaz on Zee tv by Bhajan Samrat Anup Jalota ji, late Padmashri Jagjit Singh ji, Sudha Malhotra ji and Kailash Kher. She has also won the Global Indian Music Award for the album "Cinema"- a collaborative album. She has been performing internationally and has been a part of various national as well as international music festivals.